Back in November, I got to write the update that Credo passed the $1M mark in work sent to pros on the platform. This was almost exactly one year after the relaunch. What made it even sweeter was that I wrote that update while in Prague with my wife as we traveled the world for just under a month. 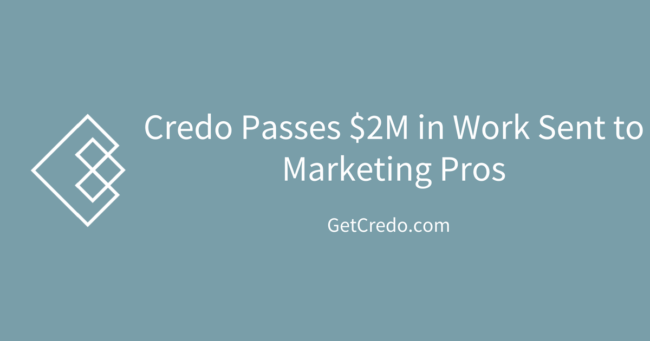 As of Monday February 27th, Credo has now sent over $2 million worth of work to pros on the platform. This is especially exciting to see because while it took a full year to hit the first million, it’s only taken four months to hit the second million. I never imagined that would happen. A few people asking how this compares to last year. Well, +159% sessions, +179% new users, +51% avg session duration, +2% bounce rate. I’m currently crushing long hours and investing in growth to get the next version of the platform out, which I am very excited about. Are you an agency or solo consultant and want to get involved? Learn more , then start the process here to see if you are a good fit. If you are, then you can schedule a call and I’ll give you more information!